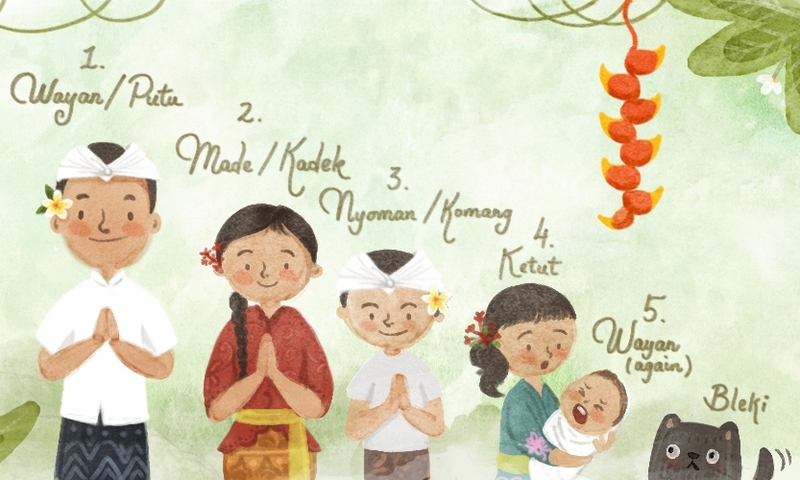 Balinese Names – How are they chosen? When guests visit us for scuba diving in Bali they not only struggle with the millions of rupiah they get for their buck, but also with the Balinese names. Fifth born starts again with Wayan, but with another word attached to show they are Wayan number 2 in the family. There is no real concept of a surname. Subsequent Balinese names can indicate their place in society, physical attribute, good qualities that the parent wish upon them or names having a special Hindu meaning. With aristocratic heritage the names Gusti or Dewa are often used. Warriors or Kings in the lineage often use Ngurah or Agung. The highest caste, priests or those with high religious status will use Ida Bagus (good) for males and Ida Ayu (beautiful) for females. Some parents give their children more personal Balinese names such as Rai (strong), Setiawan or Seti (faithful) or Dewi (a Hindu goddess). So how do you know if Made is a male or female? If you see I Wayan it’s male or Ni Wayan it’s female. The prefix of I and Ni denotes the gender of the person. At Diving Indo we have a broad spectrum of cultures from many different areas of Indonesia spanning Hindu, Christian and Muslim religions. We luckily don’t have two people with the same name, so there is no confusion. If you want to read more about the Diving Indo family check out our About Us page.